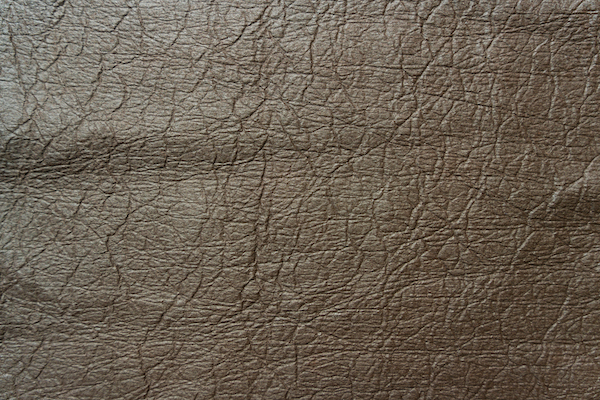 Pinatex is a natural, sustainable, vegan-friendly alternative to leather, made from pineapple leaf fibres. Pretty cool hey? Better yet, the leaves are a waste product from the pineapple fruit harvest, so no extra resources (land, water, fertilisers or pesticides) have to go into producing them. 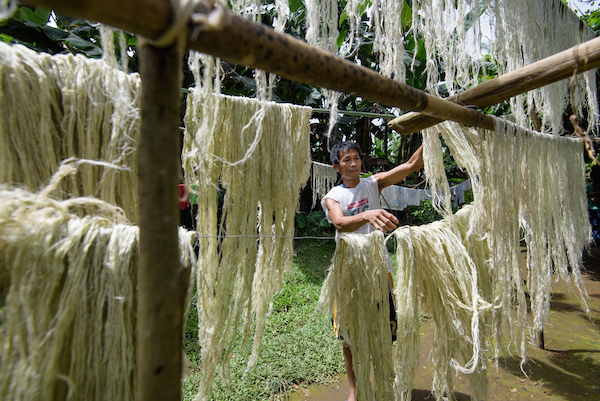 The material also provides extra funding to the Filipino farmers who grow them. Pinatex was developed by Dr. Carmen Hijosa over seven years of research & development. Carmen worked as a consultant in the leather goods industry in the Philipines in the 1990’s, and she was shocked by the environmental impact of mass leather production and chemical tanning. Knowing that PVC alternatives were not the solution (many cheap ‘vegan’ items are made from this, yet it is far from eco-friendly as it creates and releases toxic chemicals during its manufacture and use), Carmen set out to create a new sustainable textile. She wanted something that could be “commercially produced, provide positive social and economic impact and maintain a low environmental footprint throughout its life cycle”. This is one of my favourite uses of Pinatex I have seen yet. I love how the stitching and the artisanal, reclaimed wood handles are so in harmony with the Pinatex material. 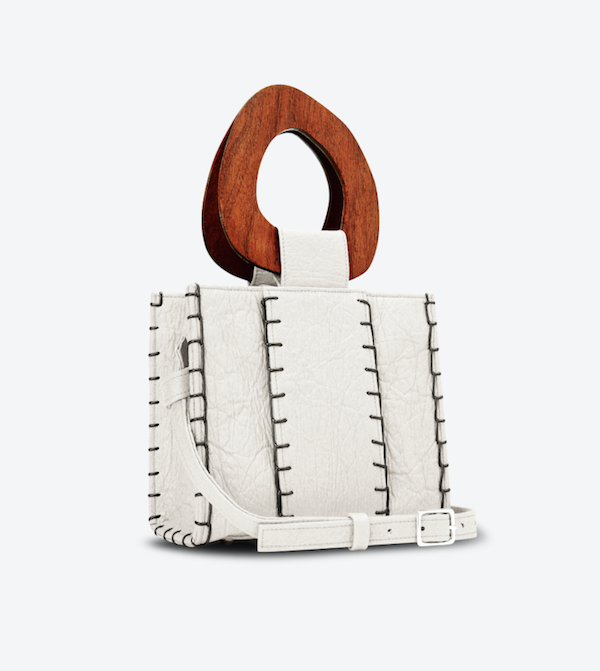 This off white Bibi Bag is by EDUN, and is made in Kenya in fair trade conditions. EDUN are a high-end fashion brand, with a mission to create positive social change through sustainable and ethical fashion. They are based in New York, and source their pieces from artisans in Africa. (You can watch how their Pinatex bags are made in the video below). Manavai is a new Chilean vegan footwear brand that emphasises slow, sustainable and fairly made fashion. These stunning Labradorita heeled mules combine Pinatex with a wooden heel, GOTS certified organic cotton lining & insole, a rubber sole, and natural stones encased in a 24k gold plated connector. I love that they come in a linen and organic cotton dust bag too! Not just for accessories, Altiir show that Pinatex can also be used in clothing. Their bold, statement biker jackets are a nod to 60’s rock’n’roll counterculture, and come in men’s and women’s styles, in gold, silver, black and brown colours. They even sell detachable ‘shearling’-look collars, made from organic cotton. Altiir’s jackets are made in Italy, and are lined with cupro bemberg cotton (a silky-feeling, breathable material, made from cotton cellulose fibres). HFS Collective (previously called Hipsters For Sisters) are wonderful for so many reasons. 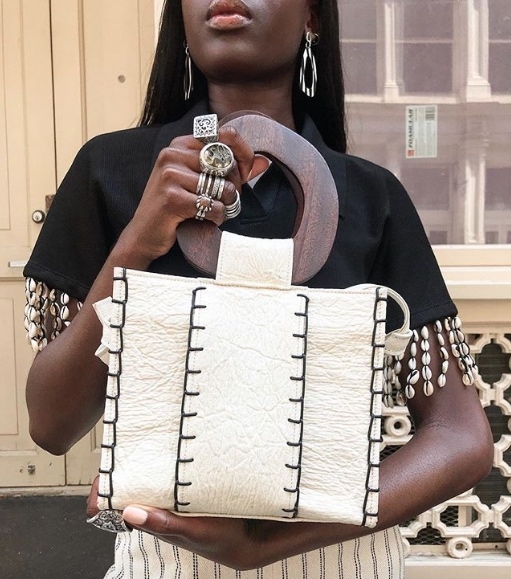 They are passionate about sustainable, ethical and vegan fashion, and they make hands-free bags designed to to liberate women from their luggage. HFS is run by a lovely mother-daughter team in Los Angeles, where their bags are also made. “We know every person that cuts and sews our bags and feel good that we can help provide them with a fair, living wage in a safe, happy and healthy workplace”. I have one of HFS’s belt bags and honestly it’s my favourite bag. It makes carrying and getting fast access to your belongings oh so easy! It’s especially handy when travelling. Bourgeois Boheme are creators of well-made, ethical, vegan shoes for men and women. BB are constantly looking towards innovative, sustainable materials, and feature Pinatex in several of their styles. 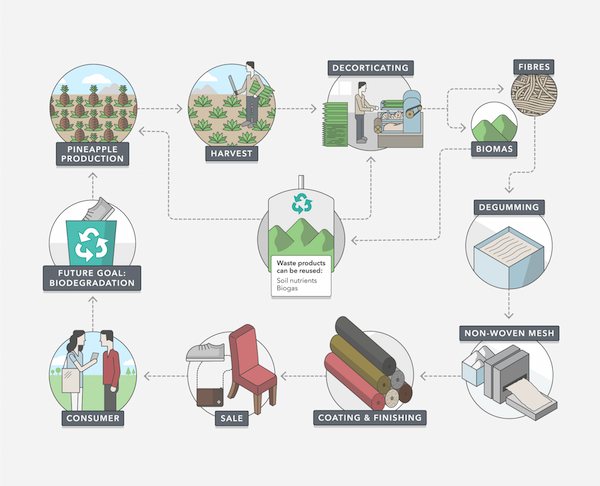 They also use eco materials like cork and seed-based Bio-polyoils linings. BB is based in London, and their shoes are all made fairly in Portugal. You can always count on Polish designer Alexandra K for luxurious vegan handbags. Her latest collections have been moving more and more towards sustainability, and feature innovative eco materials like Pinatex, apple leather, quartz and recycled textiles. Alexandra K’s accessories are handmade in limited quantities in Europe. Just to show that the use of Pinatex goes beyond fashion too, here is an instance of it employed in upholstery furnishing. This Spider Chair is made by Tamasine Osher Design, a London based artisan furniture company that creates one-off and limited edition bold pieces. Their creations combine traditional methods with modern technology to create furniture that lasts. Images courtesy of Pinatex and the respective brands.